RAFINA, Greece (AP) — The death toll from twin wildfires that raged through Greek seaside areas looked set to increase to around 50 Tuesday after rescue crews reported finding the bodies of more than 20 people huddled closely together near a beach northeast of the capital, Athens. The official death toll stood at 24 early Tuesday. Authorities said that more than 100 people were injured, including 11 in serious condition. They could not immediately confirm reports of many more deaths, but rescue crews working through the charred areas where the fire had passed through to the northeast of Athens told local media that at first light, they had found the bodies of more than 20 people gathered in one place near a beach. The head of Greece's Red Cross, Nikos Oikonomopoulos, told Skai television a member of a Red Cross rescue team had told him the crew had found 26 bodies, apparently families, huddled tightly together, many of them hugging. Merchant Marine deputy minister Nektarios Santorinios, whose ministry is in charge of the coast guard, said more than 700 people had been evacuated by sea by the coast guard. The dock area became a makeshift hospital as paramedics checked survivors, some of them clad in only their bathing suits, when they came off coast guard vessels and private boats. The operation continued through the night. "It took people by surprise and the events happened very fast. Also, the fires broke out on many fronts, so all these factors made the situation extremely difficult," he said. "The task we face now is organizing the identification of victims by members of their families." The fire posed no immediate threat to Greece's famed ancient monuments, but as it raged inland, children's' summer camps and holiday homes were hastily abandoned. Fleeing drivers clogged highways into the capital, hampering the firefighting effort, and flecks of ash swirled onto central Athens. "It's a difficult night for Greece," Prime Minister Alexis Tsipras said after cutting short a trip to Bosnia and returning to Athens. 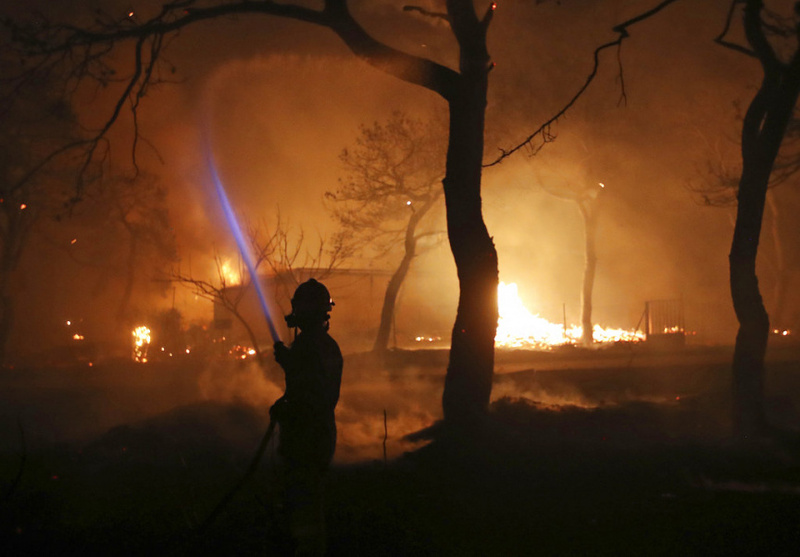 Greek Fire Service officials issued public pleas for residents in fire-affected areas to comply with evacuation orders and not stay on in an effort to save their homes.